Weekend Birding usually features native wild birds, but this winter the weather has been horrible with endless amounts of snow and ice that makes walking in the forest preserves treacherous. Other than backyard birds, I haven’t been out to take any new photos in weeks, which is why today’s bird is a non-native species, the Peafowl. 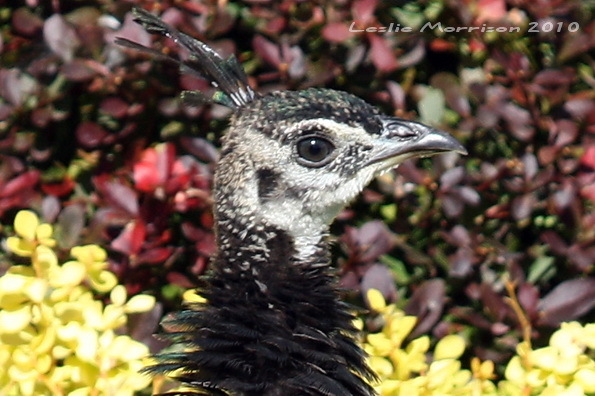 Peafowl are members of the Pheasant family and are native to India, Pakistan, and Sri Lanka. Most people call the birds Peacocks, but that name only refers to the male. Females are Penhens and the young are Peachicks. I took these photos a few years ago at Chicago’s Brookfield Zoo. They have a free-ranging flock and the birds are allowed to wander the grounds and occasionally startle visitors with their loud squawk or quick hop onto a tree branch. In the winter the birds move to a large heated area where they are provided with plenty of food and warmth as the species is not adapted to Chicago’s harsh winters. I’m accustomed to seeing them roaming around and don’t usually stop to take photos, except this time I spotted a couple of hens with their chicks, something I don’t see very often. The Peahen builds the nest and sits on the eggs for four weeks, then she raises the chicks by herself. First year male and female Peachicks look just like their mother but are only half her size. They roost overnight in groups in tall, open trees. I finally found one of the males strutting around on the other side of the grounds. The male is very flashy with his bright blue head and neck. The female and her chicks are subdued brown color. Since it was not mating season he wasn’t displaying his beautiful tail of feathers but did pause long enough for a photo. 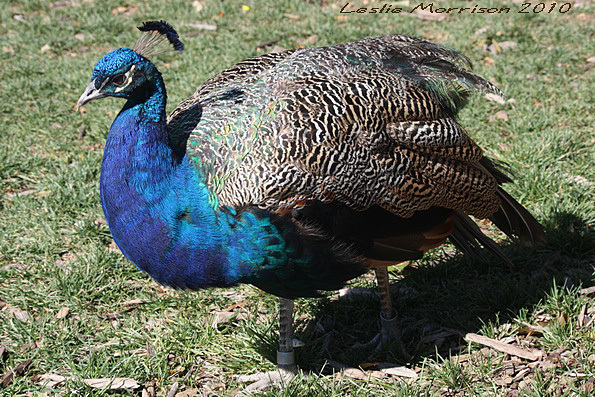 ‘The male is very flashy with his bright blue head and neck… Since it was not mating season he wasn’t displaying his beautiful tail of feathers but did pause long enough for a photo. ‘ Just like anyother male! Love this part. Great photos. It was so cold here that I was not even very sucessful at spotting birds for the Great Backyard Bird Count. I’m not good enough at identification to spot anything other than common birds, and the week prior to the count, I saw lovely Blue Jays for a short time, and many hawks, but nothing on the weekend. The weather was awful here too for the Backyard Bird Count. I was unable to get to the forest preserve trails so I counted the birds in my backyard, which was only about 10 species. I enjoyed your beautiful photos, as well as your write-up about peafowl. 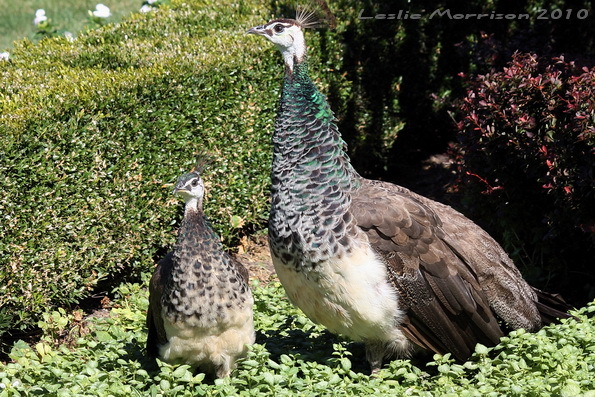 We stayed at a B&B once that had peafowl roaming its garden. The thing I remember most is the ungodly shriek they made. Sounded like someone was being murdered! But the beauty of the males made up for that. Yeah, they can be quite noisy. They are absolutely gorgeous! Thanks for sharing them…and these fun facts. And thanks for visiting my blog. Again informative and interesting. At first I thought you saw this in your area. 😉 But you’re right about “…snow and ice make walking in the forest preserves treacherous”. Let me add one more. Yesterday I braved the cold and ventured out by the river cause I saw a huge flock of ducks. But just as I steadied myself in the snow and clicked on my camera, a Coyote was alerted and saw me. Lucky he was more scared than i was and quickly ran away. I took a few pic. of it running. Adding to my terror was how it looked. He had lost half of its fur, very skinny and no fur on its tail. No disrespect, but he was an ugly looking wild animal. Last year I had a squirrel hanging out in my yard that was missing half the fur on it’s body and tail and it was scratching itself raw. I called the wildlife rehab people to see if anything could be done for it and they said it probably had mange. They said it’s highly contagious and even humans can get it so if I rescued the squirrel to use heavy gloves. I was hoping there was some medicine I could put in food to leave out for it – no way I was picking it up – but no, it needed a medicinal bath to kill the mite infection. Ewwwwh. That’s probably what was ailing your poor coyote. Good thing he ran away from you. Beautiful photos as usual! Thank you for this birding lesson on the Peafowl and Peacock. We saw numerous Peacocks at a “village” in Kauai. Beautiful! The last time I visited St. Augustine, Florida I took a photo of an all white peacock. Nice to see the peahen. They never seem to get much publicity. The females never do. It’s almost always the male with the fancy plumage. I had no idea that peacock only refers to the males. They’re gorgeous birds! Are peacocks related to turkeys, I wonder …. Good question. I looked up the scientific classification and found they are both members of the Phasianidae family. So I guess they would be related. Gorgeous pics! My neighbour used to have a family of these- they liked to live on our roof! gorgeous! birds and photos – thx for sharing .. I hope your weather improves soon, but I always enjoy seeing a peacock. A surprising number of people keep them on properties here. I love these pics (and the info). I didn’t know only those flashy males are called peacocks. That lieele baby is adorable.